I have a whole library of self-help books. They are such good teachers to me. Good books are real treasures, and this one in the picture is one of them. Do More Great Work is written by a man who has a gift for understanding the anatomy of great work. 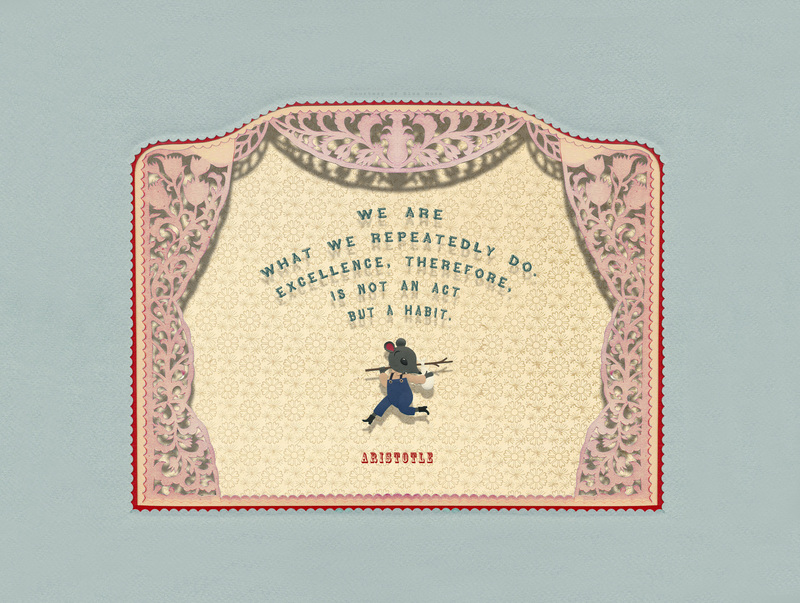 Here we're talking about quality work, the one that is meaninful and that makes us feel really proud of ourselves. I agree with the author: whatever work we do is basically bad work, good work or great work. In which one of these three places do we spend most of our time? Watch the little video below to have an idea of what bad work, good work and great work is. One thing is for sure: we all have the potential to do great work most of the time. This Google survey is such a great tool. I'm grateful that Google created it for us, for free. I really appreciate it. Thanks a lot Google! And now the awards ceremony, Tadaaaa!!. As you can see the winner is: The Grasshopper and the Ant!!!! The prizes are: a big piece of chocolate for the Ant and a clarinet for the Grasshopper. Second place: The Fox and the Stork!!!! Prizes: A book about good manners for the Fox and a yummy dinner for the Stork at her favorite restaurant by the lake. And third place: The Country Mouse and the Town Mouse!!!! Prizes: A new country house for the Country Mouse :). And speed bicycle for the Town Mouse so he can move around the city but also visit his cousin in the countryside. But the best part is that each illustration had 17 votes or more. That makes me so happy! It means that each one is well liked. Thanks a lot for your vote, this survey was lots of fun. Have a wonderful day!! Here's a picture of the little corner where I created the 8 illustrations for the book. Instead of going up here I improvised a mini work station in our master bedroom. That way I was able to stay closer to the kids during that intense time and I could also work at night when my outside and inside world is a lot quieter. Several years ago I used to think that having a studio was the ultimate way to confirm that an artist was a real artist. My whole life I dreamed about having a real studio, exactly like the one that I have now. When Bill and I moved to our new house almost 9 years ago I was thrilled to finally have a real studio, which is located in the back of our home. I adore my studio. But I discovered that the space where you create doesn't really define you as an artist at all. I go back to the time when I had nothing, no studio or even house. The most extreme place where I lived was a small tiny room, about the size of a queen bed. There was no kitchen or anything in there. I had a miniature bathroom where I could hardly fit. I didn't even have a real bed. All I had was this set of 2 baby mattresses that I displayed next to each other at night. That's where I slept. But I remember that time as one of the most creative periods of my life. The only tools I had were a couple of regular writing pencils and a few blank sheets of paper. Regarding food I had very little as well. Basically crackers and guava jam. I had to carefully plan my daily portions of food so I could feed myself properly during the week. I had to do the same thing with the pencils and paper. But I managed to survive and even feel happy. At night I had a ritual. I put a wooden board on my lap (that was my table) and then I got the pencils and papers and I drew tiny little fantastic worlds for hours. I made a whole series of those drawings, they were beautiful and very detailed. While drawing at night on my improvised table I felt pretty hungry, but I also felt lucky. I learned that imagination only needed the most basic conditions to get into action. Now that my life is a lot more complex because I have a family, a house, a car, a studio...I have started to need simplicity more than ever. Having all the basic material needs covered is super nice, I know that very well because I come from having nothing at all which is really hard. It's wonderful to have water in your house 24 hours a day and a refrigerator and toilet paper and other luxuries that we take for granted sometimes. BUT, material things are tricky if you base your dreams on them. If we blame the material world for what we're not doing then we won't be able to go anywhere. We need to make use of our secret super powers. The real key to progress and personal growth in my opinion has nothing to do with the objects that we own but with the dreams and ideas that we own and our desire to bring them to life. Art and creativity are not a destination in my opinion, something that you will get at one day when the conditions are created. For the artist art should be like a vehicle, something that helps us stay alive and in motion so we can go to places, have experiences and learn new things. Creating the illustrations for the book in a little corner of our bedroom made me remember the old times when I had to improvise a studio everyday. It made me remember that our desire to stay alive creatively, to move forward and make thinks happen is possible under whatever conditions we have. Creating the 8 illustrations for the book was wonderful. But it was also hard, because I have lots of other important things to take care of. I was in fact going to reject this project in the first place to be honest. But I realized that there isn't an ideal time for making our dreams come true. Life will always be hard for one reason or another. But as long as we don't abandon our capacity to adapt and dream and act, we will always keep moving forward. Today I'm excited to announce the results of our favorite animal survey. Yay! But this mini survey gives us enough information to start our award ceremony anyway. Ready???!! Followed by best supporting male actor/musician: The Grasshopper!!! Followed by best naked animal actor: The Wolf!!!! And don't forget the Ant! She won the 4th place and a Golden Globe. The Tortoise follows the Ant slowly and steady. For that we give her a small Silver Globe, about the size of a golf ball. Thanks a lot for participating in the survey! It was lots of fun! I am going to spend this whole weekend gathering energies for Monday. On Monday we will be attending Diego's IEP, a very important meeting. Today I'm back with a whole post about my tools. 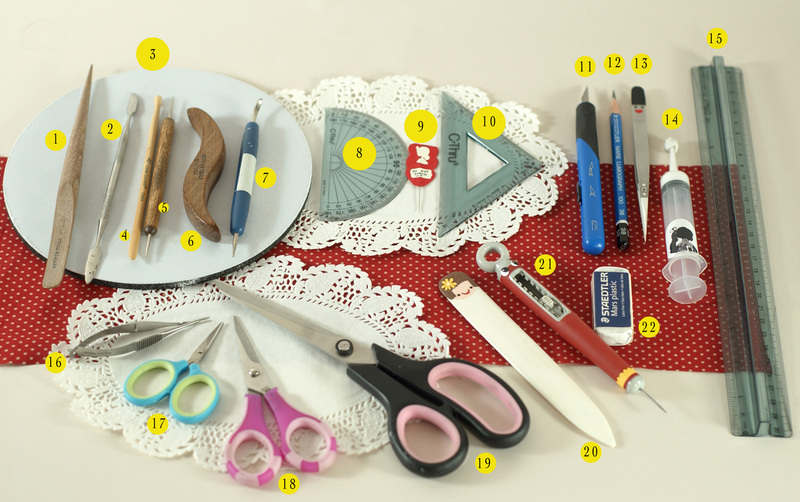 I get several e-mails asking about what tools I use for my papercuts. Below I'll share a list of them. I also need to say that if you ever wrote me an e-mail and never heard back from me, please, Oh please! (as Diego says) don't be mad at me please. It's just humanly impossible for me to respond so many e-mails individually. But I hope that this post answers some of your questions. For my one-color-only, flat papercuts, I just use my X-Acto knife with a #11 blade, a cutting matt underneath the paper for protection, a pencil for drawing the design and an eraser to correct the drawing if necessary. View this photo in a larger size. 1- I use both sides of this wooden tool for shaping paper. 2- Metal dentist tool for shaping paper as well. 3- Computer mouse pad for supporting the paper during the shaping or embossing process. A mouse pad has proven to be the best support for shaping my papers so far, because it has a nice cushioning surface that allows the paper to gently expand as you press it down with any of the tools that I show you here. 4- Another wooden tool for shaping paper. 5- Ball stylus tool for shaping and creasing paper. 6- Another wooden tool for shaping paper. 7- My favorite tool for shaping paper! I can do all the work of paper shaping with that single tool. Unfortunately I have no idea where I got it from or even when. I have had it forever. A few months ago it got lost and I almost called 911, I can't live without it. I did a little Internet search and found it here where it's called Maxon #3 Burnisher. I don't know exactly what this tool is originally designed for. (But you could use about anything for shaping paper. A small metal spoon works nice; use the handle as well as the round part. Just make sure to apply the pressure on the paper gradually, moving the tool in circles. Before I mastered this I had to practice it a lot, there is no formula in particular, you just need to do it a lot and observe how the paper behaves. The paper itself will "tell" you what to do. Up to this day I haven't found a single book explaining how to do this. I had to teach myself how to do it. If I were going to teach anybody my technique I would need to do it in person. Or I would need to write a whole book with lots of detailed pictures. One day I will offer classes, when the kids are a little older and one day I will also write a book on paper "sculpting"). 8- Small protractor for drawing curves. 9- Needle for pocking holes on paper. I just took a regular sewing needle and glued it between two pieces of card to make it easier for me to manipulate. You could also make a polymer clay handle. 11- X-Acto knife with a # 11 blade for cutting paper. I replace the blade as soon as the sharp tiny tip breaks. That way I don't have to make lots of pressure with my hand which keeps my wrist relaxed and healthy. 12- Pencil with soft lead for drawing on paper. 13- Tweezers for handling small pieces of paper. 14- Syringe where I keep my Acid-free glue. One of the questions that I get asked the most is: What type of glue do you use for your papercuts?. I use several, as long as they are pH neutral. Right now the one that I'm using in this project is a PH Neutral Bookbinding adhesive from a brand named LINECO. See the picture below. I just place a little bit of it in my plastic syringe. The syringe has a tiny aperture for applying the glue, that gives you lots of control over the amount of glue to use. I recommend you to use as little glue as possible on your paper. A tiny miniature touch of it will do the job. I keep the tip of the syringe closed with a bead made out of putty, which is some kind of soft polymer material that never dries, it looks like chewing gum. Chewing gum could be a good substitute by the way and it's easily found in different flavors and shapes in supermarkets and other places :). Also, if your child or you, or even your pet gets chewing gum on the hair here is a genius way to remove it. 16- Miniature precision scissors from here. 18- Small size scissors. (my favorite). They're so nice and sharp. 21- Retractable owl. It has the same use as the regular needle to pock holes. The tools number 13, 20 and 21 have little faces on them. That's not mandatory for you to do. I make little faces for some of my tools because that humanizes them and I love to think that my tools and I together form a team. Sometimes when I am not feeling like working I look at them and they look back at me with their little eyes like saying: Come on Elsita! Do you want us to lay down here on this table forever? So, the bottom line is that little faces on tools are great motivators. Before I forget, I also get many e-mails asking how many times I have cut myself with the X-Acto knife. I have identified a whole group of fellows who are really afraid of knifes. Here is my answer: I have got cut zero times. Yay!! I will keep my fingers crossed so I never get cut by the X-Acto knife. Well, I don't think that it's a good idea to keep our fingers crossed while using the X-Acto knife. But as an alternative we could cross our toes. I think that the key is to keep our 5 senses awake and the table always organized. Using a retractable knife helps too. I hope that this post was helpful and that you didn't fall asleep. Today I want to share the evolution of The Tortoise and the Hare illustration with you. After the first version was finished I got feedback from my editor on behalf of the Auzou team about reconsidering the way I illustrated this fable. Aude (my editor) suggested that I bring some movement to this illustration since it's about a race, a rather famous race. We all know about the hare and the tortoise race because it has been represented extensibly in many cultures. I like the first version a lot, but the more I thought about the idea of movement for this scene the more I liked it. So I went on with the changes. First, I convinced the hare to change his clothes to something more sporty and second, I got the tortoise a pair of colorful shoes. Then I asked both of them to run as fast as they could. The tortoise didn't start running right away because she came up with this idea of wearing a little sailor hat. I said yes and then things started falling into place. I also changed some of the stage elements in order to make it less distracting and the rocks became the place where the race ends. As you can see the tortoise touched the rocks first while the hare is still in the air absolutely in shock! He can't believe that the tortoise got to the rocks first! The final result is a more fun illustration which brings more character to the book. I like both versions a lot but the 2nd one works a lot better for the book. I think that children are going to like seeing the animals running. Yay!! The Hare and the tortoise look different from what you saw before because I did some changes in that illustration. I will talk about that tomorrow because it's something very interesting that I would like to share. I love my new animal friends so much! They're very real in my head, like people that I have known for a long time. The process of preparation and anticipation of these little buddies reminds me of when I had Natalie and Diego. I don't feel like I designed these characters, it's more like I gave birth to them. I'm having a hard time choosing a single one because I love them all equally. But I feel something very special about the little ant. She's so quiet and modest. Just look her sweet eyes. She's making a huge effort carrying a giant weight on her back but she does it with such grace, she makes it look as if it is not that hard. I found myself the other day carefully watching a tiny ant on my desk, it was fascinating. Seeing such a tiny little thing, alive, moving around. Nature is wonderful.